A signed copy of a Jane Austen novel published in 1816 has been bought for £325,000. The book is a first edition copy of Emma which Austen presented to her friend Anne Sharp, the inspiration for Mrs Weston in the novel. 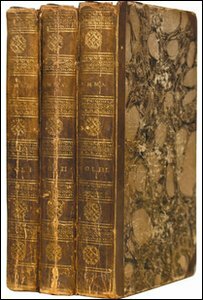 Jonkers Rare Books in Oxfordshire paid £180,000 for it at auction in 2008. It is understood that a British collector bought the book, which is one of 12 special 'presentation' copies Austen gave to friends and family. The book has previously been exhibited in Hong Kong, New York and San Francisco. The rest of the presentation copies were donated to relatives. Christian Jonkers, director of Jonkers Rare Books in Henley-on-Thames, said: "We had several clients around the world who were considering this book, but it is pleasing that the book will remain in this country. "It is unique, considering the whole historical context of the book - the fact that it was given by Austen to her best friend who was a model for one of the principal characters in the novel."